Luckily, we have had very mild winter this year. Normally, I have had to send one of my sons up on the roof to clean it off many times by now, but since we haven't had nearly as much snow as usual, this has only needed done a couple of times so far. 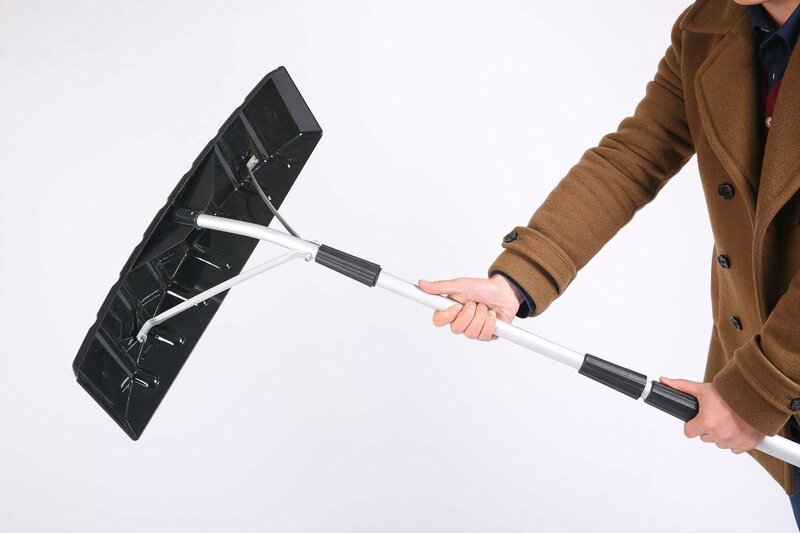 After last night's snow storm, today would have meant another trip to he roof if I hadn't just got this Ohuhu 21' Twist-n-Lock Telescoping Snow Shovel Roof Rake with 6" by 25" Poly Blade. Although there no instructions in the box, it only took my son a minute to determine how to assemble it and had it together in less than 5 minutes using the tools that were enclosed in the box. This product is very light weight, at under 5 pounds, so just about anyone should be able to use it. The pole extends anywhere from 6 feet when not in use, up to 21 feet long for the really high roofs. My son was able to reach easily up to the peak of the roof to clear the snow from my roof. Once the snow was cleared, it was easy to collapse it back down to the 6 foot length for storage. Some areas of my roof are difficult to get into with the 25 inch wide blade, but other than those areas, it worked wonderfully. I loved that I did not have to send my son onto the roof in icy weather. I am always worried about someone slipping and falling off the roof, but this is no longer a concern.